"I've been fantasizing this for a very long time; I've made the film in my head. All the pictures are there. It's played out many, many times." There is no disputing former Monty Python member Terry Gilliam's role as one of modern day's most imaginative directors, one willing to go the extra mile to make daring, visually high-calorie fantasy films that are thankfully more than just a little off-center. With Brazil, The Adventures of Baron Munchausen, 12 Monkeys, Time Bandits, The Fisher King, and Fear and Loathing in Las Vegas under his belt, Gilliam has not shown himself to be shy about tackling conventionally unconventional projects that often take on a life of their own. Such a project was the sadly ill-fated The Man Who Killed Don Quixote. Battles aren't new to Gilliam; from his monumental struggles for the ultimate control of a director's intended vision with Brazil (see the superb three-disc Criterion release or read Gilliam on Gilliam) to the infamous and wild budgetary overruns on The Adventures of Baron Munchausen that nearly made him an industry pariah, he has always been on the edge, both creatively and financially. A retelling of Cervantes' Don Quixote had been gnawing at Gilliam for over a decade, and while his addition of a modern day time-traveller (Johnny Depp) into the story seemed somehow perfectly logical (or rather, perfectly Gilliam), the insurmountable task of actually getting the film made could never have been imagined. Or could it? Orson Welles fell victim to a similar "Quixote curse," and like Gilliam, his project never saw the light of day. 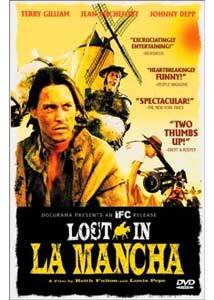 Lost in La Mancha comes from filmmakers Louis Pepe and Keith Fulton, who previously made what is highly regarded as one of the definitive "making of" features (12 Monkeys' The Hamster Factor). The pair set out in 2000 to document Gilliam's making of The Man Who Killed Don Quixote, a trippy fantasy based on Cervantes' classic book starring Jean Rochefort; Pepe and Fulton's intention, I imagine, was to create another in-depth "making of" piece to eventually be part of a DVD release. What they didn't know (at least right away) was that instead, they would be helming a documentary that revealed the brutal and cruel realities that seemingly doomed Gilliam's film from the outset. "This is no way to make a film!" Lost in La Mancha begins eight weeks out from production, and the troubles are already beginning to pile up. Gilliam's budget has been trimmed from $40 million to $31 million, and while The Man Who Killed Don Quixote is set to be one of the most expensive films made exclusively with European funds, it becomes apparent that there just isn't going to be enough money to make the grandiose and fantastic film he envisioned. But that's the least of his worries. What follows is everything from violent rain storms, set-destroying floods, insurance problems, finicky horses, the debilitating illness of star Rochefort, and a remote location that was next to a NATO bombing range that filled the sky with roaring F-16s. What makes a documentary like Lost in La Mancha not only riveting, but so heartbreaking, is that we, the viewers, are there for every catastrophic misstep and fumble as it happens, and the persistent (but slowly waning) hope and determination of Gilliam, who tries to plod forward and get his film made, are routinely pummeled before our eyes. Pepe and Fulton are there to capture it all, and while the director battles with lifesize puppets and nervous investors, the project itself sinks deeper and deeper into quicksand. There are plenty none-so-subtle parallels between Cervantes' Quixote and Gilliam himself in Lost in La Mancha, and it is truly frustrating from a fan (ok, idolizer) standpoint to sit back and watch such a creative visionary get trounced by the fates. Like the song says, "To dream, the impossible dream..."
But, boy, does it make for a great documentary. Image Transfer Review: The film is presented in its original 1.33:1 aspect ratio, and the transfer is a good one. Colors are solid and very warm, and while maybe not on par with a big-budget feature film, for a documentary the presentation and image detail is consistently strong and crisp. No major print flaws were apparent. Audio Transfer Review: The box says Dolby Digital 5.1, but in fact the audio is presented in a respectable 2.0 surround mix. As with most documentaries, this is a narration- and interview-driven project, and doesn't require much in the way of any highly involved audio fluffery, though Miriam Cutler's original music sounds especially peppy and full. The feature is cut into 16 chapters, and does not feature any subtitles (other than what are included as part of the film itself). The only other supplemental content on the first disc is a healthy batch of Docurama trailers. There is a real wealth of supplemental riches from Docurama on disc two, with over three hours of extremely worthwhile materials for the die-hard Gilliam fan. Things start off with nearly an hour of rather surprising Cast and Crew Interviews from writer/director Terry Gilliam (09m:15s); actor Johnny Depp (22m:27s); filmmakers Louis Pepe (07m:48s) and Keith Fulton (06m:47s); and producer Lucy Darwin (05m:30s). The segment is surprising because the participants are remarkably frank and upfront—this is definitely not your typical set of shallow promotional interviews. Depp gets the longest chunk, talking about his work with Gilliam on Fear and Loathing in Las Vegas, and how his involvement came about, while Pepe and Fulton discuss how they decided to do yet another piece on the director. Salman Rushdie and Terry Gilliam: A Conversation from the 29th Telluride Film Festival (54m:00s) is a product of Telluride Community TV, shot at the North American debut of Lost in La Mancha, and it is probably my favorite segment on Disc Two. I'll admit I was a bit curious about Rushdie, and was pleasantly startled at how he really showed another side of himself as not just an interviewer, but as a film fan. Gilliam, who refers to himself as "eternally naïve" talks about his career in film, but also reveals some interesting tidbits about Harry Potter, The Lord of The Rings, and Phillip Pullman's Dark Materials books. IFC Focus on Terry Gilliam (58m:00s) is the complete rough-cut of an edited piece that appeared on The Independent Film Channel in January 2003. The segment was shot at the Los Angeles Museum of Art in November 2002, and the interview is handled by the dreadlocked Elvis Mitchell. This is a slightly more serious segment (compared to the Rushdie piece), but Gilliam is always a treat to listen to, and Mitchell does a solid job as interviewer. Wrapping things up is a theatrical trailer for Lost in La Mancha, as well as a set of Storyboard and Production Stills featuring Gilliam's full storyboards for three scenes, along with production design drawings from Benjamin Fernandez and costume designs from Gabriella Pescucci. Kudos to Docurama on the extras! Lost in La Mancha is a study in compounding futility, centered around one of the most inventive filmmakers alive. The story of the horribly doomed project is funny, sad, and depressing, and makes this Gilliam fan wish even more so that The Man Who Killed Don Quixote (with Rochefort) may yet be made someday. Docurama has issued this as a well-stocked, two-disc set that deserves a rightful place on the shelf of any rabid film fan.